"Bhakti is the yoga of spiritual relationships that flies love to its highest perch." 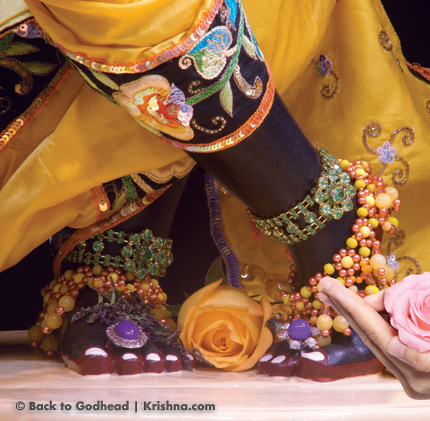 Bhakti reveals that our inherent, perfect state is as a lover. As a yoga practice, bhakti is the path of evolving the heart and is known as the yoga of love. I think of bhakti as the path of heartfulness. Given our current propensity for loving impurely and partially, how do we approach perfect love? By definition, such perfect love is possible only when we repose our love on the perfect object of love. In the prologue we saw that Shuka was experiencing boundless peace in loving the self. He was so satisfied in the self that nothing material held any sway over him; thus he transcended death. Even so, his father's Bhagavata poetry, which revealed the relationship of the self with its primordial root, the Ultimate Being, drew Shuka out of the forest to seek the higher experience. Sure, I can be satisfied in loving myself, but how much more expansive is love shared with another? Within Vedanta, the word yoga, which means "to yoke" or "to connect," refers to making a connection with our essence/source. The word bhakti comes from the Sanskrit root bhaj, "to give and receive," and indicates the type of giving that includes a full receiving. The love of this giving and receiving is centered on the Supreme Being and developed through the yoga practice of heartfulness. Rupa Goswami uses words and phrases like "friendly" and "favorable," "without selfish desires or ulterior motives," and "perpetual, ardent endeavor" to define the characteristics of pure bhakti. Our love will be friendly, unselfish, unmotivated, and constant. These sentiments and the actions that they give rise to, when expressed in relation to the Supreme Person, transform into resolute spiritual emotions and spiritualize our body, mind, and senses. When our culture of bhakti becomes continuous and fully mature, love condenses into wise-love and we're transported, even before death, to the homeland of consciousness. In summary, bhakti means unadulterated, loving responsiveness to the Supreme Person expressed through the faculties of body, mind, and speech. In English, we use the word love as a synonym for other feelings. We speak of loving our pets, our friends, our families, our children and yet use the same word, love, to speak of things that simply please us – the latest movie, our favorite dish, a new piece of clothing, a breathtaking landscape. Doing this makes us lose the subtle emotional characteristics inherent in the word love. By contrast, Sanskrit has specific words for the kinds of love we feel – what we might feel for a friend or what a mother feels for her child or a lover for her/his beloved. And there's a term for the love exchanged between the self and the Supreme Beloved: prema-bhakti, or wise-love. Prema-bhaktiis a river of the most enchanting sweetness running into an ocean of unparalleled experience. Prema-bhaktiis the comprehensive, sophisticated expression of pure spiritual love. These two lovers – the Supreme Person and the finite self – are the recipients and givers of wise-love. Wise-love can onlyreach its ecstatic peak, its absolute joy, in the union between the Supreme Beloved and the lover. Therefore we, a finite self, can't remain separate from the Supreme and still experience the full expression of love, and without wise-love we'll never be completely happy. It was with interest that I learned that wise-love can only manifest when reposed in the perfect object of affection. I knew that for love to be perfect, for my selfless giving to actually become receiving (and fully satisfying), the object of my affection must be able to reciprocate all my love. Love, after all, is measured by how it is reciprocated. As my love increases, this person's love for me must also increase; otherwise love is hindered. The only person capable of unfailing love and unmatched reciprocation is the Supreme Being. Therefore, the full manifestation of wise-love is only possible when our beloved is the Supreme. If we invest our love, our being, however, in fallible objects of love, our giving will be stunted by the inability of our object of affection to reciprocate fully. Yes, my love and my being are limited, but so are his or hers. Many of us have probably had the experience of being in a relationship where the other was not willing or able to contain or reciprocate what we offered. Those persons were deficient in their ability to understand our hearts and needs, or even if they weren't, they left us at death. Perhaps we too have been that incapable person for others. Such imperfect giving may help us grow, but not always without psychological scars and heartbreaks, and certainly imperfect love can't deliver to us the full experience of unconditional, pure spiritual love. Wise-love develops when we entrust ourselves to the infallible object of love, that source of ourselves, our Divine Other. He is both undeterred by time – he will never leave us by dying – and wholly capable of accepting what we offer and reciprocating with us beyond what we can give. Yet we have to begin our grand wise-love project from where we are: with this body-mind, in this world. We begin to glimpse wise-love when we learn to extend ordinary love unconditionally. To encourage wise-love to root and blossom, we move our hearts in the direction of our ideal by attempting to love everyone unconditionally, starting with those around us. The unconditional love of others is a standard of excellence of being in the world. By regularly interacting with others with the intent to love them unconditionally, we soften our hearts. As we experience the heart softening, we'll also see the ways in which our hearts remain hard. So this simple yet powerful practice of giving unconditional love – love without any expectation of return – will teach us just how extraordinary wise-love is, and how much the heart must melt and be spiritualized in order to reach the highest love of the Supreme. And if we want more than a glimpse of wise-love, then, at the same time, we'll water the seed of bhakti by hearing about, remembering, and serving our Divine Other. Then wise-love can mature and the petals of its flowers unfurl to show their beauty. In the process of stretching our hearts to make them flexible, useful qualities that support wise-love, such as humility and compassion, begin to eclipse our less worthy qualities. And as we use our heads (reason) to soften our hearts, we're brought to the threshold of wise-love, the doorway at which the self meets its Source. From there, we can enter the house ofspiritual emotion, which transcends mundane love and, in time and with cultivation, reaches an unconditional, uninterrupted love, or love as a state of being. Rupa Goswami, the saint whose definition of bhakti we considered at the beginning of this chapter, states that wise-love is like a million suns whereas mundane love is like a single candle. Both give light, but the illumination, intensity, purity, and joy of one cannot be compared to the other. It's difficult to imagine the brilliance of the sun and the gorgeousness of the world it reveals by looking at the flickering movement of a small candle flame in the dark. Wise-love can satiate our need for interminable, absolute love, but to achieve it we're first asked to develop new eyes with which to look at light. Ears are crucial wherever eyes cannot help. We can't see someone trapped in a storm drain, a coalmine, or under the debris of a collapsed building, but we can hear them. When we're asleep – and our eyes are closed – a way to know we're in danger is for someone to appeal to our ears with a loud "Wake up!" We tend to equate knowledge with our ability to see. We use our eyes to learn, to read, to discern between one thing and another. But hearing contributes more to our knowledge than sight does. The majority of the knowledge we gleaned through schooling was gathered, yes, by reading books with our eyes, but more so by hearing the texts and the subjects they discussed interpreted by our teachers and reflected on by fellow students. In a similar way, transcendental knowledge is acquired by hearing. To see properly, open your ears. The Upanishads, Gita, Bhagavata, and other texts are sacred sound that existed prior to being set down in writing. These sounds are not human-made but are inherent in and underlying nature. This understanding is similar to the conclusion of some mathematicians that mathematical formulas always exist and are revealed or discovered rather than invented by the human mind. We may recoil from the idea of revelation. We've heard speakers cite books to make their points only to misunderstand or misuse the text. And from revealed books of knowledge, we've also seen people form rigid rules or state that everything in the book being cited is applicable at all times and in all circumstances. This sort of interpretation of revelation is unappealing, so we step away. Illuminating sound that appears from the Supreme and enters the ears and hearts of those connected with him through wise-love is attractive and relevant. Such sound rises up from the hearts of the devoted, dances on their tongues, and finds its way into our ears. If we allow this sound to further enter our hearts, we'll live with heartfulness and move into the realm of wise-love. We might contemplate a question about how to pursue this insight: would a conscious person respond openly to us if we probed and cut and measured and stole in search of his or her secrets? A better way to know something of our lover is to earn his or her trust. Trust opens the door to a lover's innermost secrets. Trust finds full expression in love: a loving approach is the way the Infinite, who is fully capable of revealing himself to the finite, responds to us. True revelations guide us past obstacles and toward our highest self-interest. The inner life, although subtle, is deep, rich, and broad, layered with meaning and knowing not available to those who remain focused on the external world and the methods of taking and demanding. Sages, mystics, and seers show how internal perceptions can be honed and refined until we can see and speak directly to the supreme Sentient Being. The more often we head in the direction of our inner home through habit and attention, the quicker we can return fully present there, and the more profound our insights become. The inner journey is made by repeated and regular excursions inward. These refine our spiritual sensibilities and cognition. Our spiritual faculties – mind, intelligence, and a full set of senses – can perform all the functions of the mundane mind and senses. We have practical experience how the external senses of perception can be developed when there's a need. The blind describe that their hearing, smelling, and touching become acutely sensitive, for example. Similarly, those who are practiced at meditation become more aware of physical and psychic states than they were prior to learning to control the mind. Speak with pain management specialists who use breathing exercises and meditation in their practice, and you'll learn how chronic pain sufferers can change their levels of pain by controlling the mind. These are just some of the ways we can evolve our sense perception. There are subtler ways, too. The Gita was captured through an inner spiritual vision. Krishna and his warrior friend Arjuna were speaking as they drew their chariot onto a battlefield between opposing armies. They were about to wage a world war. Neither Krishna nor Arjuna wrote down their conversation. It was Sanjaya, a mystic in a king's court, who had the yogic ability to see the scene and hear the conversation in his heart even though he was distant from the battlefield. The king, who was blind and who also had sons on the battlefield, heard the details of each day's fighting from Sanjaya. He had the capacity to see and hear what was transpiring at a distance, just as, in a similar fashion, an antenna, when rightly made and positioned, can deliver sound and images to the viewing instrument. Seers explain that sounds of revelation form a bridge between matter and spirit. These sounds activate and enable the spiritual heart and senses to perceive things that are beyond the world of matter. In other words, I have an inherent ability to perceive everything in the land of consciousness, and books of revelation serve as outlines to guide me there. The bhakti texts are love letters from the kind heart of the Divine Person, written about his life, which invite us to the homeland of our hearts. As poignant as Bhakti Vedantic texts are, many are abstract, and because they are so voluminous, making sense of them requires assistance from one who has assimilated and harmonized them in his or her practical life. Homeward-bound teachers help us tease out the meanings and applications of revealed sound. Do we really need scriptures? Do we really need a guide? Not if we listened to the world that always speaks to us. But we don't listen, usually, and even when we do, we don't listen like seers. We're not always sure what we're hearing. We don't always have enough context to understand what's being revealed to us. We purposely or helplessly talk and take and pillage and then ignore all the grieving sounds others make as they suffer at our hands. After all, we think, I'm inherently good. What can be done? Keeping company with someone who is listening, whose ears, eyes, and heart attend to the Absolute, opens us to how we too can hear and see revelation. A saint listening to the song of the Supreme in her or his heart can help us hear. A seer can help us see.